Tania is a full time artist that enjoys working in a variety of media, but it is drawing that is closest to her heart. She uses mixed media, acrylic paint and ink to experiment with line, texture and colour. 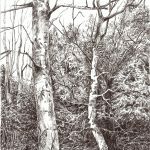 She has always had a love for nature and horticulture, drawing inspiration from these when drawing and painting. When drawing the occasional urban scene, it is the quality of light and shadow that captures her attention. Tania was born in South Africa, but currently lives in Surrey. The Surrey hills and woodland frequently feature in her art.